What Lens Should You Buy Next? One of the questions that new photographers ask most often is, “What lens should I buy next?” The answer depends on so many different factors that it’s virtually impossible to tell another photographer what lens to buy. Over time lenses represent the single largest investment in your photographic system, so it pays to take a long-term view when buying lenses. Chances are good that sooner or later you’ll buy a new camera body. And when you do, you’ll want your existing lenses to be compatible with the new camera body. Canon EF lenses are compatible with both cropped-sensor cameras such as the EOS 40D and all of the Rebel models as well as with Canon full-frame digital SLR cameras. 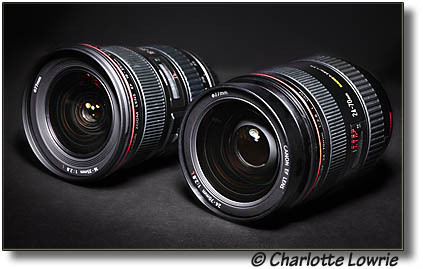 By contrast, Canon EF-S lenses are compatible only with the cropped-sensor cameras. EF lenses represent an investment that will serve you well now and in the future if you decide to buy a full-frame camera. But if you’re certain that you’ll stick with the cropped-sensor Canon cameras, then EF-S lenses are also a good investment. Learn to read and evaluate lens test reports that are published in photo magazines and on Web sites. Also ask experienced photographers about lenses that you’re considering before you buy. Canon has a good book that introduces the Canon lens line-up and explains lens characteristics: EF Lens Work III: The Eyes of EOS. While I can't tell you what lens is best for you, I can say that for my specific shooting needs, the three lenses that no one could pry out of my hands are the EF 24-70mm f/2.8L USM, the EF 70-200mm f/2.8L IS USM, and the EF 100mm f/2.8 Macro USM lens. These lenses are fast, dependable, offer excellent sharpness and contrast, and they serve my specific shooting needs beautifully. Your choices, of course, may differ. My Digital Field Guide books including the books on the Canon EOS 5D Mark III, Canon EOS 7D, EOS Rebel T3i/600D, EOS 60D, and the EOS 50D include chapters that discuss features to look for when buying lenses. About the author: Charlotte Lowrie is an award-winning freelance journalist and photographer based in Seattle. She is the author of 17 photography books, numerous magazine articles, and she teaches photography classes at BetterPhoto.com.